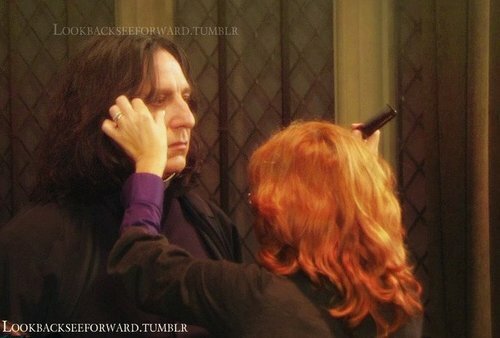 I WISH THAT WAS LILY ... ♥. The make - up artist looks like Lily ...from the back :/. HD Wallpaper and background images in the severus snape club tagged: severus snape alan rickman death death scene deathly hallows part 1 potions master proffesor snape. This severus snape photo might contain retrato, tiro en la cabeza, primer, headshot, primer plano, en la cabeza, and closeup. Oh yes, nice to see that ! A knut for your thoughts, Severus ? I love the way Alan remains focused. Great actor, really. I wish! that was ME!! !